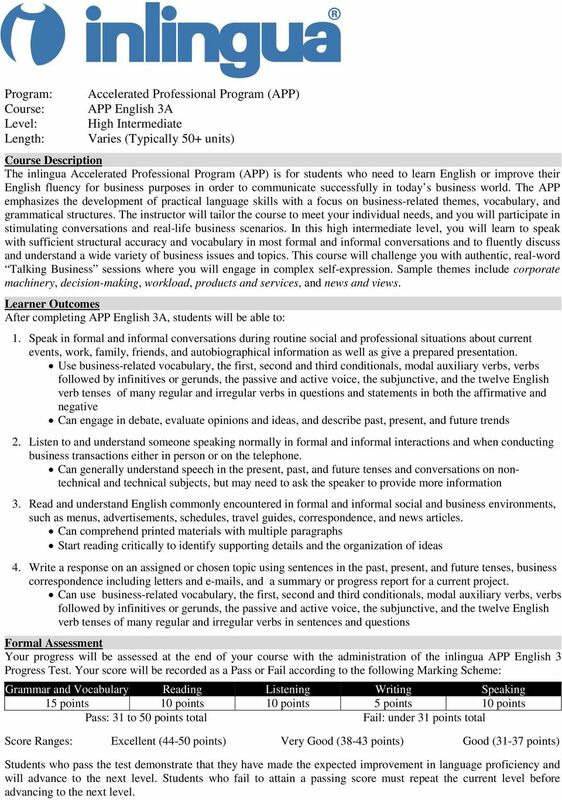 Download "Accelerated Professional Program (APP) Absolute Beginner Varies (Typically 50+ units)"
3 APP English 2A Low Intermediate grammatical structures. The instructor will tailor the course to meet your individual needs, and you will participate in stimulating conversations and real-life business scenarios. 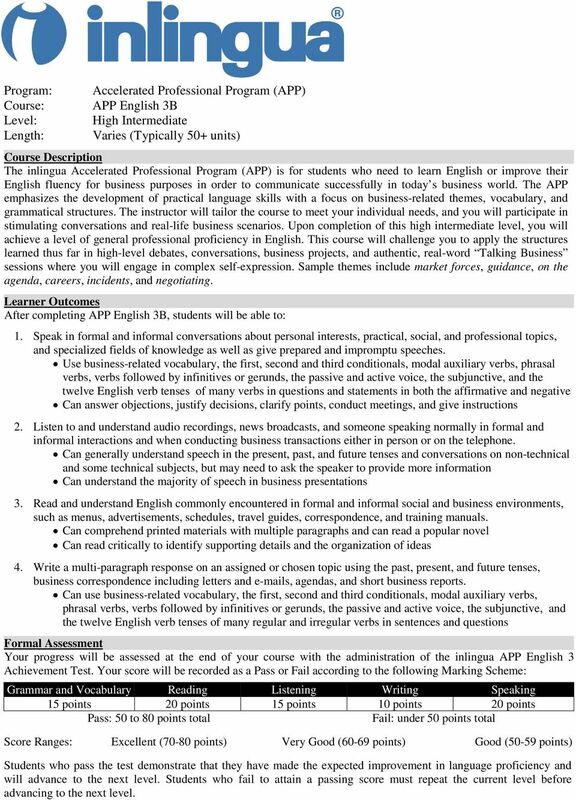 In this low intermediate level, you will effectively conduct basic business activities in English in the four language skill areas and begin using more complex grammatical structures and vocabulary. You will be able to satisfy routine social demands and limited work requirements. Sample themes include trade shows, sales meetings, health and safety at work, marketing, people at work, and project management and contracts. 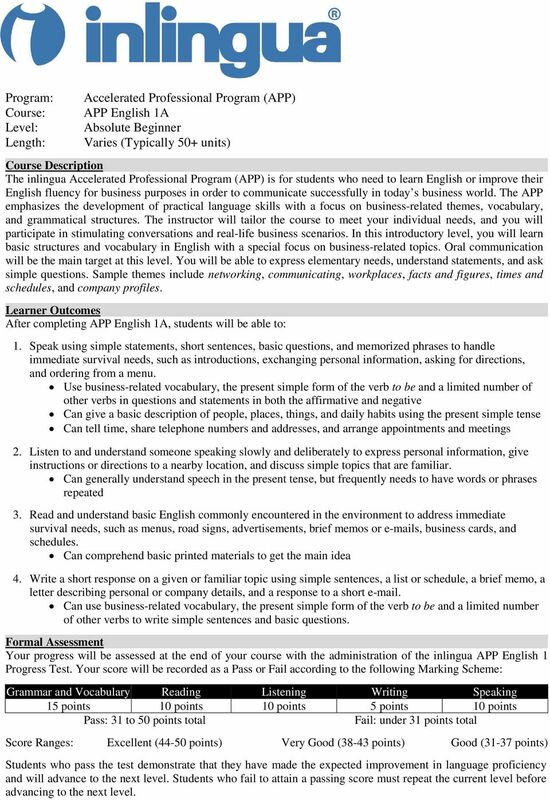 After completing APP English 2A, students will be able to: 1. Speak in simple conversations during routine social and professional situations about current events, work, family, friends, and autobiographical information as well as prepare a short presentation. Use business-related vocabulary, the first conditional, modal auxiliary verbs, and the present simple, present progressive, present perfect, past simple, and future simple forms of the verb to be and a number of regular and irregular verbs in questions and statements in both the affirmative and negative Can give a description of people, places, things, past experiences, and future goals Can share opinions, make predictions, communicate on the phone, and make suggestions 2. Listen to and understand someone speaking slowly in routine social and professional interactions and when conducting simple business transactions either in person or on the telephone. Can generally understand speech in the present, past, and future tenses, but occasionally needs to have words or phrases repeated 3. Read and understand English commonly encountered in everyday social and business environments, such as menus, road signs, maps, advertisements, travel guides, agendas, contracts, and financial indicators. Can comprehend printed materials with multiple paragraphs to get the main idea 4. Write a response on a given topic using simple sentences in the past, present, and future tenses, simple business correspondence including letters and s, and a report detailing progress on a project. Can use business-related vocabulary, the first conditional, modal auxiliary verbs, and the present simple, present progressive, present perfect, past simple, and future simple forms of the verb to be and a number of regular and irregular verbs to write simple sentences and questions. Your progress will be assessed at the end of your course with the administration of the inlingua APP English 2 Progress Test. Your score will be recorded as a Pass or Fail according to the following Marking Scheme: 15 points 10 points 10 points 5 points 10 points Pass: 31 to 50 points total Fail: under 31 points total Score Ranges: Excellent (44-50 points) Very Good (38-43 points) Good (31-37 points) will advance to the next level. Students who fail to attain a passing score must repeat the current level before advancing to the next level. 8 APP English 4B Advanced grammatical structures. The instructor will tailor the course to meet your individual needs, and you will participate in stimulating conversations and real-life business scenarios. 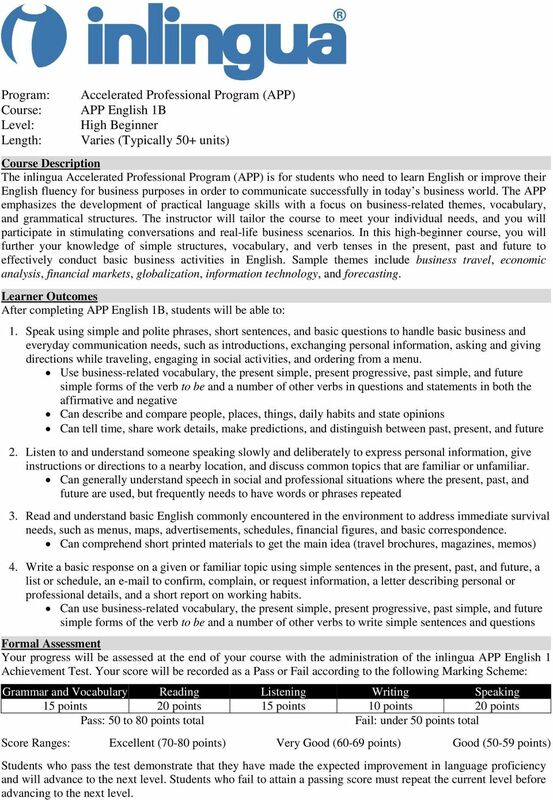 Upon completion of this advanced level, you will reach a level of full proficiency in English and will be able to use the language fluently and accurately in most business and social situations. This course will also challenge you with authentic, real-word Talking Business sessions where you will engage in complex self-expression. Sample themes include green credentials, value, change, managing people, matters of opinion, foresight, selling, and doing deals. After completing APP 4B, students will be able to: 1. 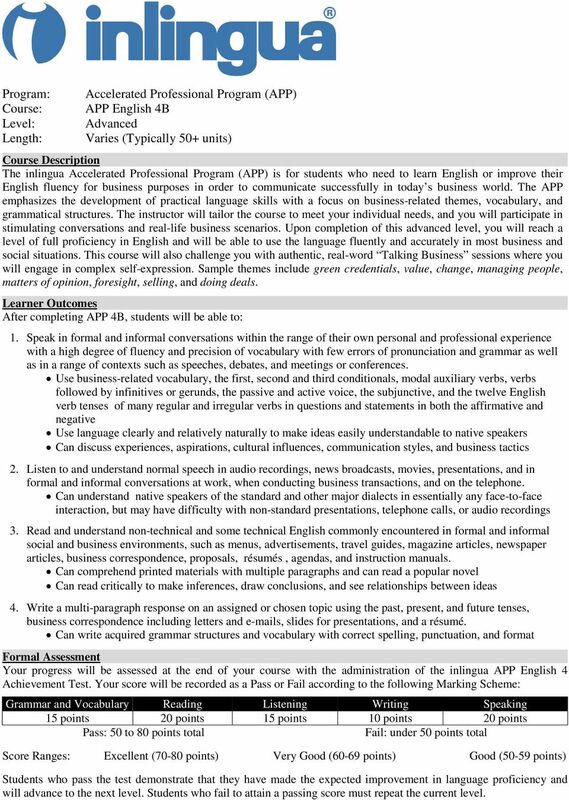 Speak in formal and informal conversations within the range of their own personal and professional experience with a high degree of fluency and precision of vocabulary with few errors of pronunciation and grammar as well as in a range of contexts such as speeches, debates, and meetings or conferences. 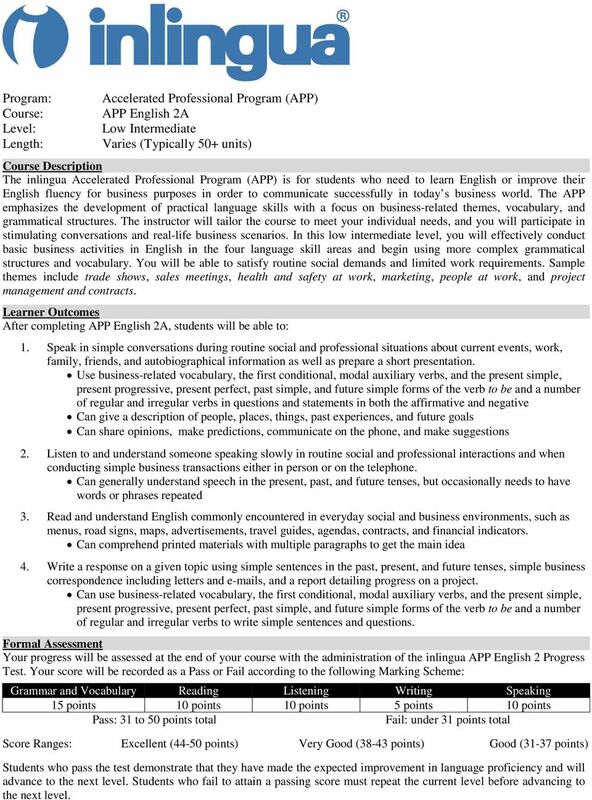 Use business-related vocabulary, the first, second and third conditionals, modal auxiliary verbs, verbs followed by infinitives or gerunds, the passive and active voice, the subjunctive, and the twelve English verb tenses of many regular and irregular verbs in questions and statements in both the affirmative and negative Use language clearly and relatively naturally to make ideas easily understandable to native speakers Can discuss experiences, aspirations, cultural influences, communication styles, and business tactics 2. Listen to and understand normal speech in audio recordings, news broadcasts, movies, presentations, and in formal and informal conversations at work, when conducting business transactions, and on the telephone. Can understand native speakers of the standard and other major dialects in essentially any face-to-face interaction, but may have difficulty with non-standard presentations, telephone calls, or audio recordings 3. Read and understand non-technical and some technical English commonly encountered in formal and informal social and business environments, such as menus, advertisements, travel guides, magazine articles, newspaper articles, business correspondence, proposals, résumés, agendas, and instruction manuals. Can comprehend printed materials with multiple paragraphs and can read a popular novel Can read critically to make inferences, draw conclusions, and see relationships between ideas 4. Write a multi-paragraph response on an assigned or chosen topic using the past, present, and future tenses, business correspondence including letters and s, slides for presentations, and a résumé. Can write acquired grammar structures and vocabulary with correct spelling, punctuation, and format Your progress will be assessed at the end of your course with the administration of the inlingua APP English 4 Achievement Test. Your score will be recorded as a Pass or Fail according to the following Marking Scheme: 15 points 20 points 15 points 10 points 20 points Pass: 50 to 80 points total Fail: under 50 points total Score Ranges: Excellent (70-80 points) Very Good (60-69 points) Good (50-59 points) will advance to the next level. Students who fail to attain a passing score must repeat the current level. Course: TL2 1 Level: Beginner The inlingua TL2 Summer English Escape and Adventure are short-term, intensive ESL courses for students who need to improve their English proficiency for general purposes. PICAI Italian Language Courses for Adults 6865, Christophe-Colomb, Montreal, Quebec Tel: 514-271 5590 Fax: 514 271 5593 Email: picai@axess. Tutorial Guide www.versanttest.com Introduction Welcome to the. 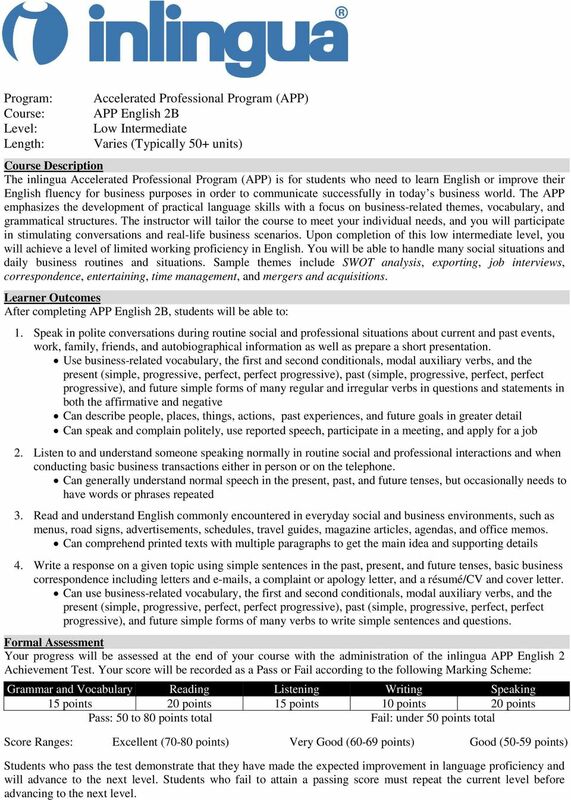 This accurate and reliable test quickly measures proficiency in English communication in workplace contexts, and includes reading and writing. Institut für Fremdsprachen Hochschule Karlsruhe Technik und Wirtschaft Course Descriptions. Programme Catalogue. Delivering the highest quality learning experience! 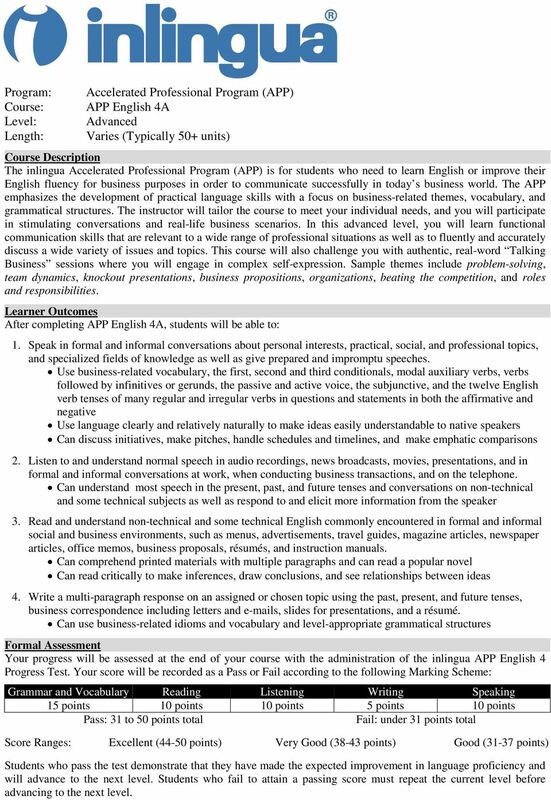 ENGLISH LANGUAGE LEARNER (ELL) PROFICIENCY STANDARDS LISTENING AND SPEAKING Introduction Research consistently indicates that all language learners pass through a silent" stage before they begin speaking. Public places are full of opportunities to learn English. The English printed on shop windows can help you improve your English.